Syrian government forces regroup outside Idlib, which was taken by an Islamist coalition, including the Al-Qaeda-affiliated Al-Nusra Front. Syrian troops regrouped on Sunday after a coalition including Al-Qaeda's local affiliate seized the city of Idlib, the second provincial capital to fall from government control, AFP reports. The capture is a blow to the government and raises the prospect that Idlib will become the effective capital of territory held by Al-Qaeda's Syrian wing, Al-Nusra Front, analysts said. On Sunday, the city in northwestern Syria was largely quiet, after sporadic government aerial bombardment overnight, the Britain-based Syrian Observatory for Human Rights monitor said. 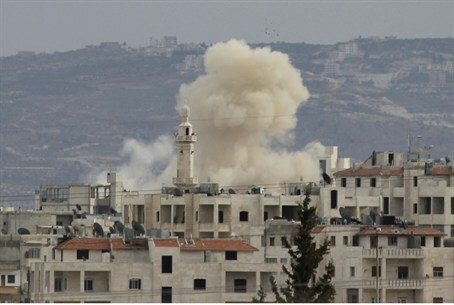 A security source in Damascus and Syrian media said government forces were regrouping outside the city. "Forces are repositioning on the outskirts of Idlib in order to face the terrorist battalions... and be in the best position to repel their attack," a security source in Damascus told AFP. Al-Watan newspaper, which is close to the Syrian government, said troops had carried out a "successful operation regrouping south of the city." "Army reinforcements were sent to start a military operation to regain control of the areas that were vacated after the evacuation of the local population to safe areas," the daily added, citing a source on the ground. A coalition of Islamist forces overran Idlib on Saturday, after an operation that began just five days earlier and killed at least 170 opposition and regime forces. The city becomes only the second provincial capital to fall from regime control after Raqa, in northern Syria, which was seized by rebel groups in March 2013. Those groups were subsequently ousted from the city by the Islamic State (ISIS) jihadist group, which has made Raqa the de facto Syrian capital of its self-declared Islamic "caliphate" on Syrian and Iraqi territory. Earlier Sunday, the Syrian Observatory for Human Rights said that Syrian government forces had executed at least 15 prisoners in Idlib before Islamists overran the city.